Identity Evropa, a white supremacist group, has been active in Ypsilanti recently. Last week they were posting about the Civil War Memorial in Ypsilanti's Highland Cemetery. (Interestingly, that Civil War Memorial was intentionally placed over the graves of both black and white Civil War vets.) 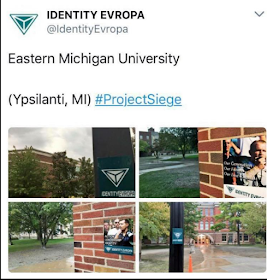 Today, it looks like members of Identity Evropa have been engaging in a stickering campaign on Eastern's Campus. We know that white supremacist groups are trying to recruit on campuses this fall. It's important that we as a community band together to support vulnerable members and groups in the face of racism.